Jack Del Rio is coaching like the Raiders are already in Las Vegas. 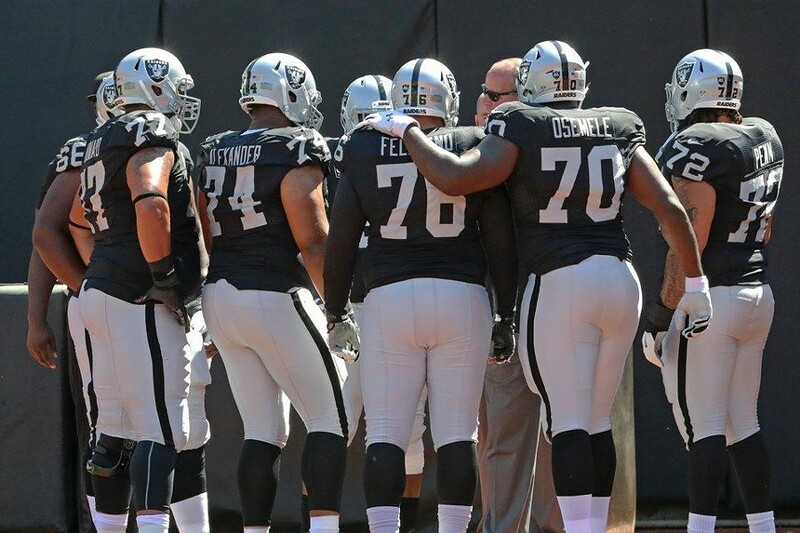 This week, "Black Jack Del Rio" made another dice-roll call during a crucial moment in the game. The Raiders found themselves fourth and goal on the two-yard line, in the final quarter — and Del Rio gave his offense the green light to go for it. And, just like last week, the coach was rewarded with a Derek Carr-to-Michael Crabtree strike. This touchdown notched Sunday's game against the Atlanta Falcons at a 21-21 tie with 12 minutes remaining. The Raiders much-hyped defense had zero answer for Atlanta's run-pass attack, which racked up 531 total yards in its 35-28 road victory in Oakland. Devonta Freeman and Tevin Coleman bruised the Raiders front line for a combined 139 rushing yards. Matt Ryan went air for 396. The Falcons owned the middle of the field, with Ryan repeatedly finding Jacob Tamme and Julio Jones on slant routes. The Falcons also got the big breaks. In the fourth quarter, on third and goal, a Ryan pass was deflected, only to land in wideout Justin Hardy's hands, which put Atlanta up 35-21. The Raiders didn't go down quiet, however, and clawed within seven. But the defense again couldn't lock in one single stop, and the Falcons converted a first down to seal the victory. 1. Raiders came out the gate cold, racking up just 33 yards of offense in the first quarter and an underwhelming 167 by the half. That's not going to cut it at home. Coordinator Bill Musgrave's schemes are again too predictable this year, and his play calling too timid early in the game. 2. Derek Carr tossed three TDs and didn't turn the ball over, but he also didn't move the ball deep. Need those big plays. 3. I actually embrace the Raiders RB-by-committee, and the guys put up a varied attack on the ground, going for 155 yards. Latavius Murray had a solid game, with 101 total yards and a TD. 4. The defense was completely lost all day, giving up multiple third-and-long conversions and a significant number of yards on the ground, including 53 yards in the opening fifteen minutes. They also clearly can't defend the middle, and teams are certainly going to pick at this weakness. 5. Amari Cooper was quiet (four catches, 55 yards), except for a fantastic 25-yard aerial grab in the second quarter. 6. The Raider defense was devoid of a meaningful pass rush. Part of this was because Matt Ryan would drop back deep, in some cases 15 yards. But mostly it was his quick release on cutting routes, such as the 21-yard slant pass to Julio Jones in the second: Jones practically skipped into the end zone and put the Falcons up 10-7. 8. The only turnover of the day for both teams was when David Amerson made a clutch pick in his own end zone, to stave off another surging Atlanta drive. This was a much-needed moment for the Raider secondary — but it was fleeting. 9. This game was very Vegas. In addition to the Del Rio call and the ridiculous Ryan TD pass to Hardy, there were also some cirque de soleil catches that converted third downs for the Falcons. 10. File under bad calls: Carr hit Cooper for a huge 70-ish yard touchdown, but it was taken back, because the official said No. 89 went out of bounds. Upon replay, however, it was clear that he did not intentionally go out of bounds, but was pushed by a defender. This non-call, non-TD changed the game. 11. But no matter: Raiders are not a good team. Yet. They still need a pass rush (shockingly), a secondary that doesn't give up big plays (that 48-yarder to Jones in crunch time! ), and they absolutely must do better to curb opponent's run attack. 12. Giving up 35 points at home — you'll never win. No players took a knee during the anthem, at least from my view in the press box.